Here at American Garage Door and Gate Systems, we are committed to providing our customers in the Denver area excellent service, as well as excellent products. Today, we’d like to feature one of those outstanding products – Genie garage door openers PowerMax 1200. We are constantly revising our product selection and ensuring that we offer only the best value products to maintain the positive reputation we’ve built over the last 35 years. This garage door opener comes with a remarkable list of features and add-ons that easily earns it a place on our “great value” list. First off, let’s take a look at the motor on this machine. It comes equipped with a ¾ HPc Power Plus 140 Volt DC motor. This motor is powerful enough to operate virtually any residential size garage door. It is extremely reliable and robust enough to pack some serious lifting force. Plus, with a speed of up to 10 inches per second, it opens up quickly so you don’t have to wait around all day to get in our out of your garage. It even comes with a limited lifetime warranty for both the motor and screw drive. This garage door opener also comes with a set of programs designed to ensure that your door works every time you want to use it, and you don’t ever have to spend frustrating minutes in your driveway waiting for the garage door to work. The SmartSet programming with its push button access makes setup a breeze. The Auto Seek Dual Frequency System ensures that your opener will work even if there is frequency interference nearby. Plus, the GenieSense Monitoring and Diagnostic Technology continuously monitors the operation of the door as it opens and makes adjustments to the power of the motor as needed. This smart technology lengthens the life of your door by reducing wear and tear, and helps minimize noise during operation. Another nice little bonus is that this opener works with all HomeLink and Car 2U systems, and it doesn’t matter how old they are. Plus, it works with the new Aladdin Connect, the garage door controller now available on smart devices. 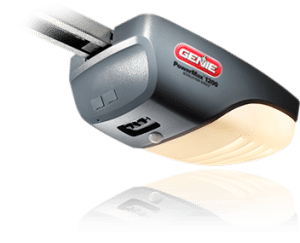 Last, but not least, the Genie garage door openers PowerMax 1200 has some great safety and security features. The Safe-T-Beam Non Contact Reversing System blankets the doorway with an invisible beam. If anything breaks that beam as the door is closing it will immediately reverse direction to prevent hitting whatever was in its path, such as small children and pets who don’t understand the dangers. The IntelliCode Access Security System works to ensure that your home is always secure from hackers that try to utilize the right radio frequency to open the door. To do accomplish this, it uses super encryption technology or rolling codes, which change the code frequently to confuse would-be hackers. As you can see, we here at American Garage Door and Gate Systems take pride in choosing effective products like the Genie garage door openers PowerMax 1200. It’s part of our commitment to providing you with the best products, the best services and the best value. To learn more about this Genie product or having us install it for you, call or contact us today.